Presidential nominations in the United States can sometimes seem like a media circus, over-hyped and overly speculative. Even informed citizens might be tempted to tune them out. Yet understanding the process, one distinct to American politics, is crucial for civic participation. If presidential elections are about who will lead the nation, presidential nominations are about who appears on the ballot. 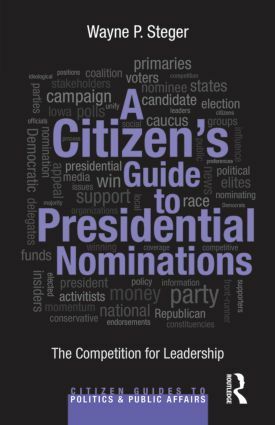 This concise and coherent Citizen’s Guide examines who has power in presidential nominations and how this affects who we as citizens choose to nominate, and ultimately to sit in the Oval Office. Political scientist Wayne Steger defines the nominating system as a tension between an "insider game" and an "outsider game." He explains how candidates must appeal to a broad spectrum of elected and party officials, political activists, and aligned groups in order to form a winning coalition within their party, which changes over time. Either these party insiders unify early behind a candidate, effectively deciding the nominee before anyone casts a vote, or they are divided and the nomination is determined by citizens voting in the caucuses and primaries. Steger portrays how shifts in party unity and the participation of core party constituencies affect the options presented to voters. Amidst all this, the candidate still matters. Primaries with one strong candidate look much different than those with a field of weaker ones. By clearly addressing the key issues, past and present, of presidential nominations, Steger’s guide will be informative, relevant, and accessible for students and general readers alike.